Shopping for a new Porsche Panamera? There are a staggering 15 models from which to choose: base cars, all-wheel-drive Panamera 4 and 4S cars, long-wheelbase Executive cars, Turbos, 4 E-Hybrids, and Turbo S E-Hybrids, some of which are available as Sport Turismos. For 2018, Porsche filled out the Panamera lineup with a bevvy of new models that start under $90,000, but in true Porsche fashion can rise to triple that. The range begins at an impressive enough 330 horsepower in the new Panamera and all-wheel drive Panamera 4. From there, the S models boast 440 hp and can hit 60 mph from a stop in as little as 4.0 seconds. 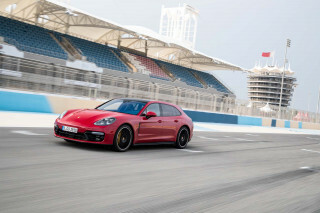 The Panamera Turbo ups things to 550 hp from its boosted V-8. Consider the Panamera E-Hybrid’s two offerings as distinctly different beasts. The lineup goes from the 462-hp Panamera 4 E-Hybrid that can travel upwards of 30 miles on only electricity to the flagship, the 918 Spyder-inspired Turbo S E-Hybrid with 680 ponies under its long hood. Simply put, there’s now a Panamera for everyone with six figures or more to spend. From the A-pillar forward, they all pretty much look the same aside from different wheels and an available sport body kit. The last generation Panamera’s mushy styling has been cast aside in favor of a cohesive look with Cayenne-like headlights and a long hoodline. From the side, the standard sedan—which really has a hatchback— is toned and sinewy, with nary a wasted line. There’s a hint of Porsche’s traditional flared hips out back as the tail works its way into a thin strip of red LEDs emblazoned with the Porsche logo. This year’s new Sport Turismo doesn’t discard with any of that heritage-laced style, instead pushing the roofline up ever-so-slightly and out well over the rear axle. The look suggests shooting brake more than station wagon, but it’s not really either. But you’re buying the Sport Turismo, which is available only in certain powertrain combinations, because you want to and not because you’re expecting gobs of utility. Its boot only holds about a shoebox worth of additional cargo over the standard Panamera. What’s good news is that the Sport Turismo doesn’t have any adverse impact on the Panamera’s inherently brilliant ride and handling. All models we’ve driven are beautifully composed and compliant as daily drivers, even the range-topping Turbo S E-Hybrid. Rear-wheel drive Panameras exist for those in, say, Miami or Los Angeles, but all but the base model shuttle power to all four corners with a quickness via an 8-speed dual-clutch transmission that Porsche calls PDK. An axle with integrated rear-wheel steering is on the options list and it’s probably worth the coin. Not only does it shrink this big four-door’s turning circle, it aids highway stability and makes it feel far more composed and confident on a twisty road. Carbon ceramic brakes are also on the options list, but try before you buy: they’re otherworldly powerful, but they can be a burden in town and boast phenomenally high running costs, even for a Porsche. Inside, it’s screens galore: twin 7.0-inch screens make up the instrument cluster and a 12.3-inch tablet-like display holds court in the center stack. Conventional models boast seating for just four, although there’s not really a bad throne in the house. The Panamera Executive with its longer wheelbase adds about 6 inches of rear-seat leg room. Sport Turismos can be ordered with either four-place seating or a new 4+1 package that discards the rear-seat center console in favor of a very narrow, high-riding middle seat. If you routinely carry five, perhaps pick a different vehicle. Predictably, the Panamera starts off well-equipped at around $86,000 for the base, rear-drive sedan. But Porsche knows that you’ll spend so much time configuring your own that they’ve equipped dealers with small samples of each paint color and upholstery choice. Nearly every surface can be swathed in something that feels like a million bucks. With the latest Panamera, Porsche pinpoints the intersection of styling and head room. The 2018 Porsche Panamera marks a departure from its predecessor, even if it’s more clearly a Porsche than a Porsche Panamera. 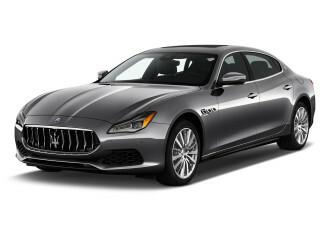 We give it a 9 out of 10 for styling, on par with cars like the Aston Rapide and Audi A7. (Read more about how we rate cars.) It gets an extra point for its interior and two for styling, with an extra emphasis on the Sport Turismo’s individuality. The first Panamera turned heads, not always for the right reasons. 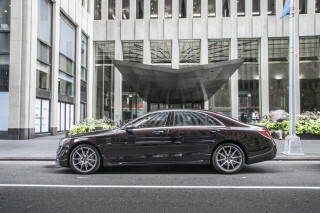 Remember the roofline, allegedly drawn tall so a CEO could fit in back? From most angles, it looked like it was designed by several teams working in different parts of Stuttgart. This latest Panamera discards with that lumpiness. Its roofline is nearly an inch lower to the slight detriment of rear-seat head room. That’s fine, we say, since Porsches are meant to be driven. Porsche tells us that the fly line—the one that moves your eye over its sinuous fenders—should remind you of some other car it builds. Any guesses? The linkage to the 911 is explicit, like the manual shift action that...well, let’s not jump ahead. Relatively short overhangs and muscular haunches are clear ties to the 911. Squint and there are more details to tie them in together, like the way the roof sweeps rearward in a fastback-style approach in the standard Panamera. At the rear, wrap-around taillights tied together with a thin strip of red LEDs and elegant chrome badging channel the 911 without appearing grafted on. A certain VW-ness creeps into the thickness of the roof pillars and their angles, but by the time the Panamera resolves it all with that slim line of taillights at its extravagantly hippy rear fenders, it’s forgotten. Most models look about the same, aside from badging and the myriad wheel choices available. E-Hybrids have polarizing tennis ball-green logos scattered about. Don’t call the Sport Turismo a wagon or a shooting brake, since it’s neither. Its roofline stretches further back and its rear window sits at a more positive angle than the standard model. Sure, they’re both hatchbacks, but the Sport Turismo is more overtly one. There’s a hint of extra room inside the Sport Turismo and its hatch aperture approaches that of crossovers, but it’s more of a big sedan in its approach to hauling cargo than a shrunken utility vehicle. Still, it’s the one we’d opt for, if for nothing other than the more interesting shadow it casts. Everything’s a high-tech affair inside the Panamera. This sedan’s low, vertical dashboard gives way to a high-mounted center console with capacitive touch switches for secondary functions. Unlike some rivals, Porsche has not discarded with a conventional gear lever. In front of the driver, Porsche places a pair of 7.0-inch screens to flank a centrally located analog tachometer. If it’s a 1975 Porsche 914 you’re hoping to trade in for your new Panamera, you’re going to be quite shocked. In the middle of the center stack sits another screen, this one a 12.3-inch wide unit. Rear seat passengers in the standard Panamera each get their own well-bolstered throne and a center console that mimics the setup up front. Panamera Sport Turismos can sub in an available 4+1 setup with a conventional rear bench—of sorts. The 2018 Porsche Panamera delivers henomenal acceleration and grip at every level. We’ve spent time in about half of the Panamera’s vast lineup of many flavors for many purposes. There’s not a bad apple in this group of five-doors that mask their girth exceptionally well. That 911 soul is there, but in some models you’ll have to look a little more deeply than others. That’s not a bad thing; after all, the Turbo S E-Hybrid is more akin to the outlandish, limited production 918 Spyder. At the bottom end, you’ll still need nearly $90,000 for the base, rear-wheel drive Panamera powered by a turbocharged 3.0-liter V-6 rated at 330 horsepower. It’ll still sprint to 60 mph in just 5.4 seconds, or 5.2 with the optional Sport Chrono package, before dropping off at 164 mph. An all-wheel-drive model badged Panamera 4 is available. Sport Chrono adds to every Panamera a button in the middle of the sport mode selector that spools up 20 seconds of extra boost. It’s a call button you’ll find yourself pushing often; if only it was bright red and not buried in black. We’ve not yet driven the base Panamera, but we imagine that it’ll be more than acceptable. Next up is the Panamera 4S powered by a twin-turbo 2.9-liter V-6. It produces 20 hp more than the engine it replaces for a total of 440. Torque increases by 22 pound-feet to 406. Porsche says the Panamera 4S can launch from 0 to 60 mph in 4.2 seconds, or 4.0 seconds with the optional Sport Chrono package, and reach a top speed of 180 mph. We have driven the 4S. Peak torque hits at 1,750 rpm and doesn’t let up until 5,500 rpm, a compelling plateau accompanied by a subtle soundtrack of V-6 whammering and twin-turbo whistling. Although everything in the lineup has at least one turbo, the Panamera Turbo spins out a healthy 550 hp from its 4.0-liter V-8. Torque tops out at 567 lb-ft, a match for the overboost figure from the last Panamera. You’ll hit 60 mph in as little as 3.4 seconds before topping out at 190 mph, assuming there’s a race track in your backyard. It’s usably faster without much of a brutish nature. Power is linear and delivered with a characteristic, but muffled V-8 roar. An 8-speed dual-clutch automatic transmission that Porsche brands as PDK (or, if you’re fluent in German, Porsche Doppelkupplungs Getriebe) is fitted to all, but it only shuttles power to the rear wheels on the base model. All other variants are all-wheel drive, even if they don’t have a 4 in their name. Paddle shifters live behind the steering wheel’s top spokes, where they should, and they fire off explosively fast shifts. Only an occasional low speed grumble endemic to this type of gearbox spoils the mood, with an emphasis on occasional. It’s hard to classify the Panamera E-Hybrid lineup; the standard 4 E-Hybrid paves the way for an all-electric Panamera Mission E, while the Turbo S E-Hybrid takes the best of the limited-run 918 Spyder and makes it more palatable and practical. Both start with run-of-the-mill Panamera engines—the 4S’ 2.9-liter V-6 in the case of the 4 E-Hybrid and the Turbo’s 4.0-liter V-8 for the Turbo S E-Hybrid. 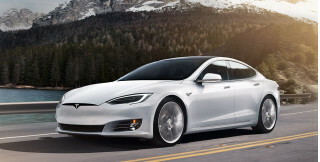 From there, they gain lithium-ion battery packs and electric motors that add a few pounds easily offset by more performance. The 4 E-Hybrid, with its combined output of 462 hp and 516 pound-feet of torque, boasts incredible power and a lightning fast 4.4-second 0-60 mph sprint. 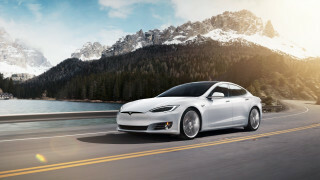 Yet it’s a plug-in hybrid that can motor along in fully electric mode for around 30 miles. The Sport Chrono package is standard here. How the 4 E-Hybrid acts is determined by its modes. It has Porsche's usual Sport and Sport+ modes, as well as a Hybrid Auto mode and an E-Power mode. The car always starts out in E-Power, which means it will run on electricity alone up to 86 mph, provided you don’t kick the throttle down past a detent in the pedal stroke. An E-Hold mode preserves the battery’s state of charge for use later, too. E-Charge, meanwhile, uses the gas engine to charge up the battery—its usefulness seems dubious unless you’re headed to an electric car-only zone. Porsche says the battery can be charged in 12.5 hours on a standard 110-volt outlet. Opt for the available 240-volt charger with its 7.2-watt capacity and the charge time falls to 2.4 hours. So if the 4 E-Hybrid is about guiltless performance, the Turbo S E-Hybrid goes in the opposite direction. It’s more in line with Porsche’s 918 Spyder both in terms of its flagship status the way it uses hybrid tech to extract more performance. An electric motor ties up to the 4.0-liter V-8 for 680 hp and 626 lb-ft of torque, but numbers are only part of the story here. All that torque is available almost immediately, which endows the Panamera Turbo S E-Hybrid with Tesla-rivaling performance. Thrust is instant and intoxicating. Yes, the Turbo S E-Hybrid boasts the same ability to motor along on electric-only power as the 4 E-Hybrid, but that feels more like a compliance decision for certain European cities angling to ban internal combustion fumes from their city limits. One demerit to both hybrid versions of the Panamera is their brake pedal feel. This regenerative system shuttles otherwise wasted energy back into the battery. These cars weigh upward of 4,800 pounds and thus require massive platters to bring things to a halt, but the hand-off between regenerative braking used for higher speeds and mechanical brakes at lower speeds under 10 mph can feel a bit awkward and grabby. This is exacerbated slightly by the available carbon ceramic units that feel so wonderful in non-hybrid Panameras. At least these hybrids don’t ride or handle any differently. Their steering remains crisp and communicative, with hints of the road traveling from pavement to palm unlike any other large luxury car. The Panamera belies its heft by shuttling into corners with aplomb, but it feels like a large, planted car when the road gets bumpy. We’ve not yet driven a Panamera with the standard suspension, but the three-mode adaptive setup provides a ride that can be cosseting or pleasantly firm. Even with optional 21-inch alloy wheels, the Panamera absorbs bumps both big and small in stride. Some credit is due to the Panamera’s hefty curb weight, which definitely smothers out some smaller heaves and bumps. If anything, it’s the Panamera’s length that plays a larger factor in the way it drives than its curb weight. The standard-length models come in at nearly 199 inches, while Executives stretch another 6 inches with all of that situated between the wheels. To combat this, an optional rear-wheel steering system modifies the rear axle. It helps the Panamera slot into typical parking spots with aplomb. But this being a Porsche, it also significantly aids high-speed stability and makes the car feel more poised and confident on a winding highway. Porsche’s most endearing passenger and cargo-hauler is finished to the brand’s expected high level. The 2018 Porsche Panamera is a hatchback, but not one that should conjure up images of base model cars in rental fleets. It’s supremely well-finished and offers above-average room for passengers in both first and second class, plus decent space for their goodies. The Panamera’s hatchback doesn’t swallow as much as an SUV like Porsche’s own Cayenne, of course. There won’t be any jamming of college-grade furniture with unpronounceable names in any prolapsed cargo hold. You’ll find 17.4 cubic feet in the back of the standard model but just 15 cubes in the Sport Turismo when the rear seat is upright. Wait, what? The wagon (or is it a shooting brake?) is less useful? Well, fold the rear seats and the Sport Turismo yields nearly 49 cubes versus a bit over 46 for the standard model. There’s decent room for luggage and larger items in either, although you’ll want to invest in a roof rack for things like skis and bicycles. A 40/20/40-split folding rear seat is included on all, but the Sport Turismo subs in what Porsche calls 4+1 seating instead of the two-place individual thrones found in the standard model. In Porsche-speak, 4+1 means a bench with a very high center hump that puts the +1’s head against the ceiling even if they’re a middle schooler. And there’s no leg room for the passenger who drew the short straw since a small console takes up the entire driveline hump. The outboard seats are the place to be, of course, but the greenhouse in this latest Panamera isn’t as expansive as that in the outgoing model. That’s a trade-off well worth the style gains, but taller passengers will find the need to bend their heads in to clear the roof line since the door aperture is minuscule. Optional 14-way adjustment for each outboard rear seat makes it as pleasant a place to be as up front. If the back seat is your jam, order up the Panamera Executive. Its 6-inch-longer wheelbase puts all of that extra space toward rear-seat leg room. There’s something a bit odd about lots of leg room and just average head room, not to mention the idea of buying a Porsche to be driven around in. Driver and passenger have a commanding view forward and although they sit low to the ground, a relatively tight belt line keeps things from feeling claustrophobic. The front seats are supremely comfortable and supportive in the models we’ve tested, although several different seat configurations are available. Between the front and rear seats sits a high center console that looks like a shiny black panel until the Panamera is fired up. Then, it becomes an aircraft-inspired array of capacitive touch switches. 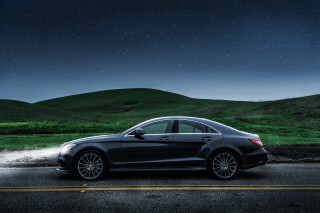 It’s not overwhelming in the way that some luxury cars can be, but there’s a lot to take in. Fortunately, steering wheel controls keep the most often-used features at the driver’s ready. The cupholders on this Panamera? One’s bigger than the other. They’re staggered, front to back. Minor niggles of the lowest order include some shiny black plastic switches and stalks, a cruise-control lever that requires a push or pull to change speeds, and an adjustable center climate vent with a mind of its own. We’ve only seen Panameras equipped the way Porsche wants customers (and the media) to see them—so, they’ve had just about every panel swathed in leather, glossy wood, or carbon fiber. When you can nearly double the price of a vehicle by adding optional equipment, it should feel special. And it does. With no crash-test scores, the 2018 Porsche Panamera waits on our score. All models have standard forward-collision warnings and automatic emergency braking, which can prevent accidents or limit the speed of impact. All-wheel drive is standard on all but the base model. A rearview camera is standard, but active lane control and adaptive cruise control sit on the options list, along with automatic parking assistance. A degree of self-driving hardware lets the Panamera stop and go with traffic, and can change lanes when all’s clear. Two new safety technologies are offered as well. A Night Vision Assistant uses a thermal imaging camera to detect people and large animals and warn drivers of their presence. Porsche's new InnoDrive system, which includes adaptive cruise control, uses navigation data and signals from radar and video sensors to compute and activate the optimal acceleration and deceleration rates, gear selections, and coasting phases for the next 1.8 miles. Like its most thrilling mechanicals, the Panamera order sheet shows little restraint. Porsche dealers have an entire area devoted to helping customers pick out just the right combination of luxurious upholsteries and trim finishers. Sure, it’s possible to spend just $86,050 on a Panamera with no optional equipment. It’s also possible to pour some lettuce into a bowl and call it a salad. But you won’t do that. The base model comes kitted out with 19-inch alloy wheels, partial leather upholstery, parking sensors, and a rearview camera. A gorgeous 12.3-inch infotainment screen with pinch-and-scroll capability features Apple CarPlay compatibility and baked-in navigation. Porsche offers three basic option packages, but that’s hardly the last step you’ll make when it comes to ordering your Panamera. The Premium Package adds in keyless ignition, blind-spot monitors, more power adjustment to the front seats with driver’s side memory, and Bose audio. It’s almost a default, must-have package. Another $2,400 adds soft-close doors, heated seats for all outboard positions, LED headlights, and front ventilated seats. 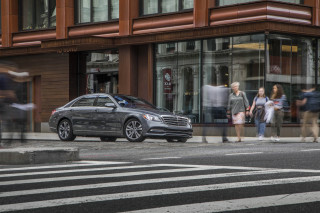 The Assistance Package, at nearly $5,400, throws adaptive cruise control that uses the navigation system to predict the road more than a mile ahead, active lane control, and night vision into the mix. From there, you’ll work your way through hundreds of additional options far too numerous to list here. They’re as mundane as $370 for a rear windshield wiper on standard Panamera bodies to as outrageous as $8,970 for carbon ceramic brakes. Of course, not everything is easy to justify. Porsche will dress just about everything short of the Panamera’s glass with leather for more than $7,000 and you’ll spend even more for 21 Burmester speakers. Porsche will happily charge you nearly $10,000 for a special paint-to-sample exterior shade of your choice and another $5,500 for matching 21-inch alloy wheels. There’s an upcharge for nearly everything imaginable, but it’s this level of essentially unrepeatable customizability that’s as responsible for Porsche’s exclusivity as the cars themselves. That said, take your time and shop carefully. With a few choice selections, you can wind up with a breathtakingly beautiful Panamera. For those who relish driving, options worth considering include the adaptive suspension and the rear-axle steering systems, both of which are well into four figures but will enhance the driving experience. For the most part, you’re paying for power the fancier you build your Panamera, although higher-spec models do include as standard a few more features than the base models. Still, there’s plenty of room for customization at every level. A Turbo S E-Hybrid we drove at the model’s press launch stickered for nearly $220,000, and that was without a power moonroof and automatic emergency braking. Adding all-wheel drive to create the Panamera 4 pushes the base price up to $90,650. The Sport Turismo runs $97,250 (that’s about $3,500 a cubic foot for its additional interior space) and the long-wheelbase Executive is $97,350. If you’re not intent on sending all of your offspring to college, it’s time to move up to the six-figure bracket. 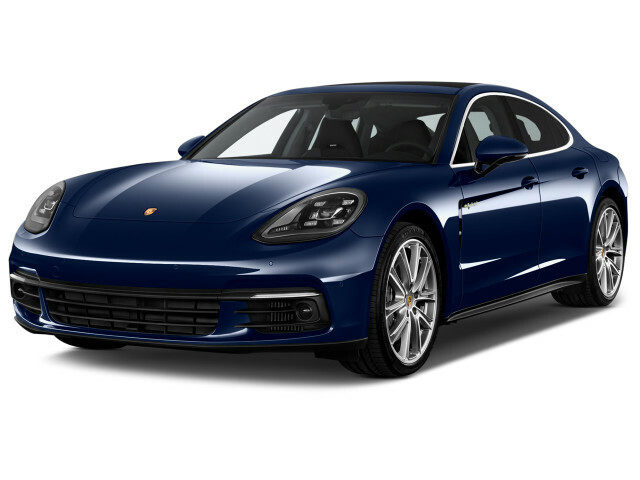 The Panamera 4 E-Hybrid runs $100,650 and for another $2,500 you’re at the Panamera 4S level. A Panamera Turbo runs $151,050, but the real flagship is actually the Turbo S E-Hybrid at $185,450. All-in, a Panamera Turbo S E-Hybrid Executive can top $270,000. Gas mileage holds pleasant surprises, while the 2018 Panamera E-Hybrid teases an electric Porsche future. The Panamera’s fuel economy doesn’t span as wide as its might, given its plug-in model. Still, gas mileage won’t haunt ethical drivers. The EPA quotes 21 mpg city, 28 highway, 24 combined for base Panamera with V-6 and rear-wheel drive. The Panamera 4 hatchback and long-wheelbase Executive hatch score 21/27/23 mpg. The Panamera 4S and 4S Executive check in at 21/28/23 mpg. The Sport Turismo 4S checks in at 20/26/23 mpg. Turbo editions rate 18/25/21 mpg. 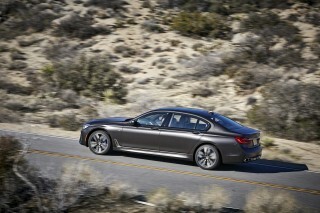 Turbo Sport Turismo editions drop slightly to 18/23/20 mpg. The Panamera 4 E-hybrid hasn’t been rated by the EPA yet, but Porsche estimates its MPGe rating at 51 mpg or h igher, with at least 20 miles of all-electric driving range.